The Set Trx Audit File Beg. 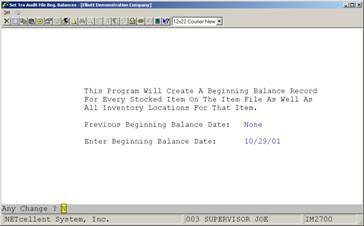 Balances application should be run at the very end of every period to set a beginning balance for all stocked items for the next period. This balance will be printed when the Inventory Trx Audit Trail Report is run and will provide a starting point from which to measure all transactions for that period. The beginning balance will be set to the current quantity on-hand for all locations where the item is stocked. Note: This application will only be used if I/M is set up for batch type inventory transaction processing. For the system to allow access to this application, the Online Update Inventory Trx? flag must be set to N and the Audit Trail On Inv Transaction ? flag must be set to Y in I/M Setup. Depending on the size of inventory transaction audit trail database, running this application can take significantly amount of time (like over an hour on very large database.) So it had been asked if this step is necessary. In our opinion, I would say this is in an “Elective” category. When you want to run a inventory trx audit trail report starting from say 05/01/18 to 5/31/18. In order for the report to give you the beginning balance of quantity for each item on 5/1/18 to show on this report, you will need this step to create that “beginning balance” record. Some people don’t care about this, then they don’t need to run this procedure. If you like to see the beginning balance quantity when run this report, then you should run this function. Also, if this report is taking a long time to run, you should consider running in on the PSQL server directly. Select the desired mode from the Set Trx Audit File Beg. Balances menu bar. 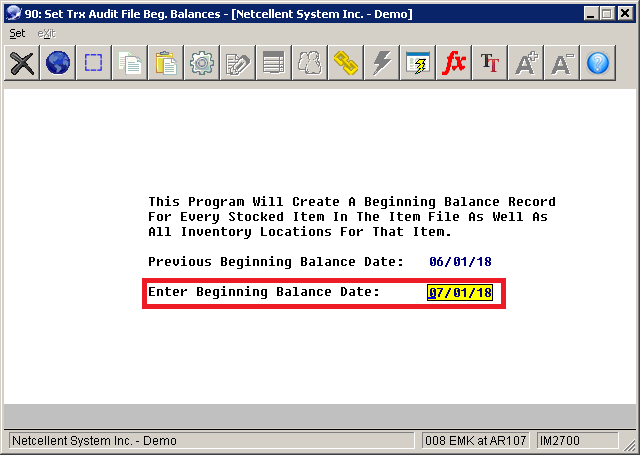 Enter the date on which the beginning balance should be set. Normally it should be the first day of the new period.